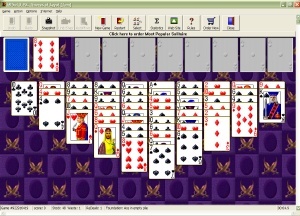 solitaire,patience,klondike,freecell,spider,pyramid,cruelinto one extraordinary game. With beautiful playing cards, full undo and redo of all your moves, automatic game saving, and complete statistics. Play the most popular games - Klondike, FreeCell, Spider, Pyramid, Scorpion, Canfield, Golf, Yukon and more! You can even submit your statistics to our web site to compare your scores with other solitaire players worldwide. Also available for Macs.